MotoGP world champion Casey Stoner made the perfect start in his bid to end a brilliant season on a high note by dominating this morning’s opening free practice session in Valencia. Once the Ducati rider jumped to the top of timesheets with only eight minutes completed he was never knocked off top spot and at one stage held a massive advantage of over a second in his quest for an 11th victory of 2007. Casey Stoner ended the session with a best time of 1.33.083, which he clocked in the final minute of the hour-long session. 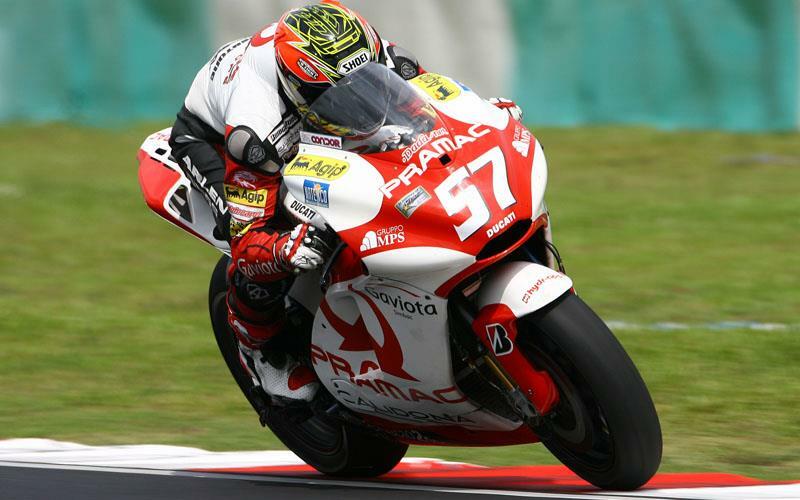 That was 0.679s ahead of Marco Melandri, who will join the Aussie in Ducati’s factory team in 2008. Casey Stoner’s 1.34.877 after eight minutes quickly saw him assume control, with that time moving him 0.524secs clear early pace setter Alex Barros. A further 19 minutes had elapsed when he became the first rider to break into the 1min 33sec barrier with a 1.33.722. That moved him a massive 1.022s clear of Brazilian veteran Barros, who admitted yesterday that he is ’90 per cent’ certain to be retiring at the end of the season, with his options in MotoGP completely gone and no competitive rides available in World Superbikes. Casey Stoner continued to stretch his advantage after 29 minutes when he logged a 1.33.412, which moved him 1.316s clear of American factory Yamaha rider Colin Edwards. Nobody could get close to Casey Stoner, with Marco Melandri’s best of 1.33.762 getting nearest to threatening the 22-year-old’s dominance. But with 23 seconds left on the clock Casey Stoner went faster again to finish the session well over half-a-second clear of the field. Home favourite Dani Pedrosa (Repsol Honda) finished third quickest with a best of 1.33.881 posted in the closing stages. That was 0.798s slower than Casey Stoner as only four other riders lapped within a second of the factory Ducati rider, who will begin testing the Bologna factory’s 2008 contender on Tuesday. Alex Barros ended up fourth fastest as Bridgestone claimed the top five times, with factory Suzuki rider Chris Vermeulen fifth quickest. Vermeulen had been as high as second with just six minutes remaining with a best of 1.34.059. Chris Vermeulen was the last rider to lap within a second of his compatriot Stoner, with Valentino Rossi down in sixth place. The Italian, who is waiting to learn whether he will be able to test Bridgestone tyres when the 2008 season kicks off with testing next Tuesday, posted a best time of 1.34.102. That was 1.019s slower than Casey Stoner. Fiat Yamaha team-mate Colin Edwards slipped down to ninth place after he’d held second for a while. The Texan, who is making his last appearance as Valentino Rossi’s team-mate before moving to the Tech 3 squad, clocked a best time of 1.34.259. Nicky Hayden (Repsol Honda), who won his world title in Valencia 12 months ago in a dramatic and emotional final round, was seventh fastest. British rider Chaz Davies ended the session 18th but suffered a big crash with four minutes remaining. The 20-year-old did climb to his feet but instantly struggled to put any weight on his right foot. He hobbled away for a few metres unaided but then stopped suddenly and needed to be helped out of the gravel trap by two marshals before he was rushed to the circuit’s medical centre.